Teaching Your Child Honesty | Learn the skills of exceptional parenting! Truth appears to be in decline. Even the meaning of the word “fact” seems to be open to debate. In a society where those in positions of authority and prestige are increasingly comfortable with not only deception, but blatant—even comical—lies, we find ourselves drowning in a sea of untruth. It can be very disorienting. And it is a difficult environment in which to raise an honest child. How do you teach your child to tell the truth in a world full of examples of people successfully using lies to get ahead? The first, and maybe most obvious, step is to be honest yourself. Modeling integrity is essential for your child to internalize it for him/herself, and the research backs this up. The science on children and deception is fascinating. A common tool for study is called a “temptation resistance paradigm”. This is a scenario where a child is tempted to do something that they know they are not supposed to, then confronted in a way that makes lying an easy escape. Typically, this is done by sitting a child in a room with an adult. A toy is placed behind the child and they are told not to look at it. A sound is played that hints at what the toy might be. For instance, if a Cookie Monster toy is used, a recording of the character singing “C is for cookie” would be played. The adult is then called out of the room. Once alone, almost all kids look. When the adult returns and asks if the child looked, kids usually lie. The temptation resistance paradigm was then used. Of the children who looked at the toy when they were not supposed to, they were much more likely to lie when they themselves had been lied to about the candy. This points to the impact that our lies can have on the honesty of our children. The bait-and-switch approach used in the above experiment seems a particularly cruel way to get a kid to do something, and it is hard to imagine many parents do that kind of thing. But parents often tell smaller lies, seemingly harmless lies. This research suggests that even small lies have the potential of teaching our children that lying is okay and that it can even be useful. If we want our children to be honest, we need to lead by example. We can teach our children honesty by modeling integrity. We can also use storytelling. In our culture, we use stories to teach morality to children. From the Bible to Aesop, children learn the value of ethical behavior and the consequences of violating those ethics. How much do we actually know about the impact of these stories? Are they effective in teaching morality and, more importantly, do they change behavior? 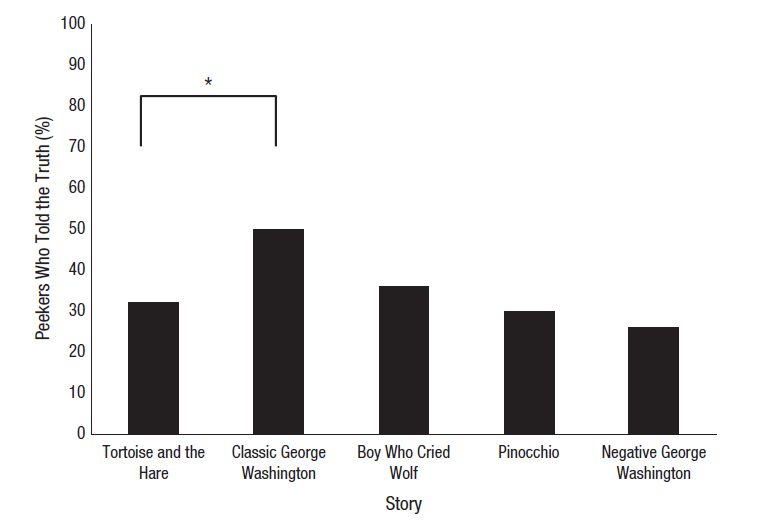 In another interesting study, researchers explored the impact of different types of storytelling on the honesty of children. They also used the temptation resistance paradigm, but this time, before asking the children if they lied, they read them a story. For some of the kids, they read stories that portrayed the consequences of lying (Pinocchio and The Boy Who Cried Wolf). For some kids, they read a story about George Washington and the cherry tree, a story that describes the value of telling the truth. The rest of the kids heard The Tortoise and the Hare, a story that has nothing to do with honesty. None of the stories impacted the children’s honesty—except the story about Washington. The researchers wanted to confirm that this was because it described the importance of telling the truth, rather than because it was about George Washington, so they ran a second experiment. This time, they told the children a version of George Washington and the Cherry Tree in which Washington lied to his father, the lie was discovered and then young George had is axe taken away and was told that his dad was disappointed in him. This version of the story had no impact on truth telling. Image from Can Classic Moral Stories Promote Honesty In Children? Clearly, the types of morality tales your child hears can impact how they internalize those values. But this can also inform how you discuss honesty in the real world. Rather than discussing the lies in your child’s life and in the larger world around him/her, as well as their consequences, it might be more effective to discuss the truth-tellers and the positive impact they are having. Instead of shouting at your radio or TV when your hear someone lying, you can turn to your child and point out the people who are approaching those topics with integrity and why that is a good thing. Even if you do all of this, your child will probably still lie from time to time. Children experiment with behavior, and lying can be a tempting way to resolve conflict and avoid the consequences of one’s actions. So what do you do? Perhaps the threat of punishment will help? Maybe expressing approval if they tell the truth? In another experiment that used the temptation resistance paradigm, researcher broke kids up into six groups. Before being asked if they had looked at the toy, they children were told something that combined two variables. The first variable was external versus internal appeals. What this means is that some were encouraged to trust their internal compass of right or wrong (internal), others were told that the adult would be pleased if they told the truth (external), while remaining children were given no appeal. The second variable was punishment versus no punishment. The first group was told if they looked, they would be in trouble. The second was assured that the adult would not be angry with them, no matter what. This created six distinct test groups. 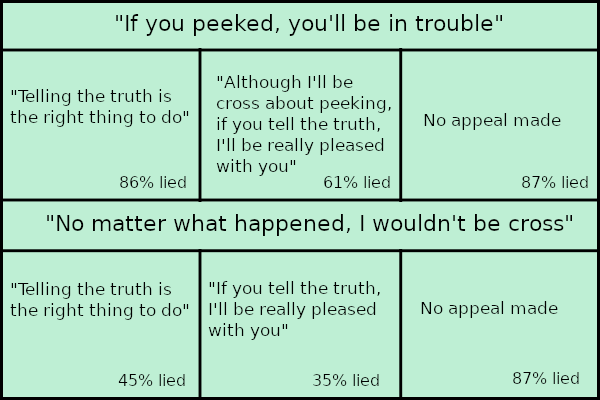 As you can see in the chart above, when children were threatened with punishment and told to rely on their inner compass (top left), they lied just as much as when no appeal was made at all (top right). Assuring kids that telling the truth was important (either by internal or external appeal) and that they would not be punished clearly was the most effect way to get a child to be honest. By far the most effective strategy was to not threaten punishment and offer praise for honesty (bottom middle). So what does all of this mean? How do we help our children cultivate honesty as a virtue? First, you should model honesty by not lying to your child. Though this often seems obvious, this principle holds true for even tiny “white” lies. Even little lies can undermine your credibility with your child and teach him/her that you really think lying is okay, even when you say that it is not. Second, emphasize stories and examples that demonstrate the value of truth-telling, rather than emphasizing the consequences of dishonesty. Finally, let your child know that you will be proud of them when they tell the truth instead of being disappointed when they lie. This last one is tricky, because the times that children are most likely to lie are the times when they have already done something that can cause disappointment and earn punishment. In these situations, my wife and I encourage our daughter to tell the truth with the understanding that honesty is important to us as a family and something we want to see from her, even when it is hard. When she confesses to something, rather than framing the consequences as a punishment for wrong-doing, we discuss her mistake in judgement (she’s a child, she is still learning how to make good choices) and the importance of correcting her mistakes. This ties the consequences more directly to her actions and frames her mistakes as part of a learning process, rather than as failure in morality. Your child will face ethical challenges and sometimes make poor choices in those moments. Using the three steps described in this article, you can help your child learn the value of honesty, even when he/she makes mistakes.